Aeroseal duct sealing uses safe sealants (safer than Latex paint) to seal off the gaps and leaks in your ductwork closing off access to insects and rodents. Fumes from stored paints, solvents, pesticides, etc. Delivering conditioned air to intended areas, thereby making your heating and cooling systems operate less frequently and run more efficiently. American homes use almost 25% of the energy consumed in the United States, with the average household spending $2000 a year on home energy bills. 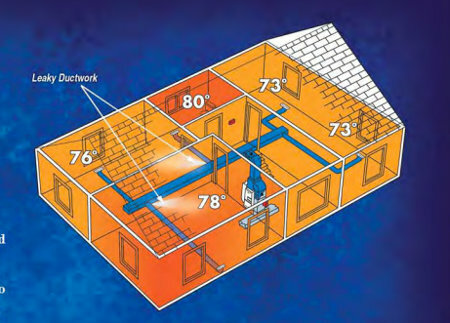 On average, 30 cents of every $1 spent on heating and cooling disappears into thin air due to leaky ducts. 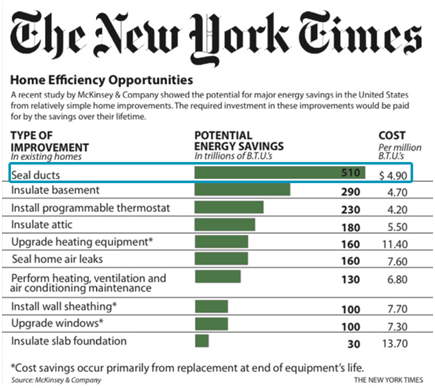 This duct leakage in homes costs consumers $25 billion each year on escaping energy. These leaks also force HVAC systems to work harder and ultimately wear out sooner. There are numerous benefits to having your duct sealing completed by a professional. When you call us for service, one of our duct sealing technicians will evaluate your system and locate any problematic areas in your ductwork that might be contributing to inefficient and inadequate heating and cooling. We can then take necessary steps to remediate the situation by sealing your ducts. This improves performance as well as energy efficiency because it reduces the loss of conditioned air into unoccupied rooms. Duct sealing adds value to your property and improves the comfort of your home. Aeroseal duct sealing helps improve the comfort of your home by stabilizing temperature levels in those hard to cool/heat rooms. Aeroseal duct sealing helps improve the efficiency of your heating and cooling (HVAC) systems by reducing the energy needed to heat and cool your home. Call us today. We’re looking forward to helping you breathe easier. Without it, all sorts of fumbles, falls, and fiascos can ensue. For example, one room or floor of a house might be uncomfortably hot while another too cold. Air you’ve paid to heat gets pushed through cracks and gaps in windows and doors to the outdoors. Meanwhile, unhealthy, humid air gets drawn into living spaces from basements and crawlspaces. Both the former (exfiltration) and latter (infiltration) cause heating costs to rise. Are you thinking to buy a new furnace or AC unit? So you want to install a high efficiency air conditioning system and you’re hoping for big savings…. It makes no sense to pay more for an energy efficient furnace or AC if you are losing heated or cooled air through leaks in the duct work… Northern Duct Services is an Aeroseal Certified contractor who will inspect and seal your duct system for leaks and proper air flow. We will test your ducts for leakage before we recommend a new, energy efficient comfort system. We could save you money installing a smaller system (if you need one). On average, 30 cents of every $1 spent on heating and cooling never makes it to your living spaces because it is leaking out of your ductwork! © 2019 Northern Duct Services. All Rights Reserved.